Contemporary Ukrainian cinematography is full of contradictions. At the turn of the decade the state of Ukrainian cinema was most accurately referred to as comatose. The destructive legacy of the 1990s had pervaded everything. There were some gestures, but not much else. For example, the Dovzhenko Film Studio was conferred with the national status, but on the whole the former film factory turned into an abandoned zone from Strugatsky’s Roadside Picnic. The Arsenal Prize for best Ukrainian full-length film, that was revived in 1997, at first went to the indisputably outstanding Three Stories by Kira Muratova, the year after that — to Aliona Demianenko’s weak film Two Yulias, and then ceased to exist as there were no full-length films to aspire for it. The years 1999-2000 were an absolute disaster, remembered only by Mykola Zaseiev’s failing Chorna rada. Representatives of the Ministry of Culture, however, were cheerfully reporting on the launches of dozens of projects, forgetting to specify that those were mainly TV films, TV series, and some short films shot by the students of the Cinema Department at Kyiv’s National University of Theater, Cinema, and Television. As for the graduates of the above-said institution, no matter how talented they were, the only road they had to follow was television, which was their end as artists. However, the habit of constant complaining is no less destructive for cinematography than the lack of money or ideas. Therefore I will focus on what we have, what we have managed to do, and what prevents us from doing more. Since the very beginning of the decade, the relatively stable existence of the Molodist International Film Festival has stood out. In its current format, Molodist is in someways a personal project of the festival’s supervisor Andrii Khalpakhchi. Molodist (and thanks to it, Ukraine as well) is included in the official schedule of film forums and attended by merited film directors and actors who come to Kyiv as honorary guests or heads of jury. Most importantly, promising foreign movie-makers consider Kyiv’s competition significant enough to send their works to compete for the festival’s Grand Prix. This is the best proof of the festival’s prestige as an international competition of debutants. As for complaints about there being too few Ukrainian films in the festival’s main nominations, I cannot but agree with Khalpakhchi who replies that this is an indication of the overall situation in national cinematography. Speaking about Ukrainian cinema, an interesting peculiarity comes to sight: in spite of the consistently critical state of film production in the first half of the 2000s, our films became winners of the world’s most prestigious festivals on a regular basis. So, in 2001, the winner of Berlinale’s parallel competition Panorama was the 10-minute short film Tyr by the Cinema Department student Taras Tomenko. In 2003, the work of another talented Ukrainian animator Stepan Koval The Tram №9 Was Going won the Berlinale’s Silver Bear for Best Short Film. The graduates of the Cinema Department at Kyiv’s Theater Institute succeeded in making mature works exclusively with the help of their talent and diligence: it took Tomenko nearly a year to polish his 10-minute short, Koval managed to make his film within a six-month period by exerting incredible efforts and nearly ruining his health. However, neither prizes nor talent changed much in the young people’s lives. In 2005 the non-action film Proty sontsia (Against the sun) directed by Ukrainian Valentyn Vasianovych won the Special Prize of Jury at the world’s most prestigious International Short Film Festival in Clermont-Ferrand. In 2006, the short film Zasyple snih dorohy (Roads will be covered with snow), a classic of Ukrainian animation, directed by Yevhen Syvokin became the winner of the same festival (Best Short Film). As for the big format, in the early 2000s the state mainly funded the historical genre, with varied success. It was of little use though, as film directors got stuck in a circle of the same topics, heroes, and periods, making films about hetmans or Banderites, and using the same old patterns: it would be enough to replace Cossacks or UPA leaders with Red Army commissars to see that the artistic quality of those movies did not essentially change from Soviet times. Oles Sanin, a pupil of Leonid Osyka, tried to offer a fresh view on Ukrainian history in his drama Mamai. The initial scenes of the film are visually perfect, but because its dramatic concept was not thought out well enough, and the director lacked inspiration, Mamai has remained nothing but a heroic attempt to renovate the historical genre. After 2004 the situation started to change. Investments into cinematography started to grow, followed by an increase in the number of full-length movies, which were not just filmed, but also shown in Ukrainian cinemas. The reason for that was the nationwide upheaval, caused by the Orange Revolution and combined with a positive economic situation, which spurred entrepreneurs to make serious investments into movie-making. A further reason was the rapid development of film distribution, which began in the late 1990s. It became profitable to open and maintain cinemas. The eternal laws of free competition and diversification of demand had their effect: many new halls were opened, enabling subsidized showings of author’s movies by low-budget art-house companies like Art-House Traffic and Avant-Garde Film. The same happened to the Dovzhenko Film Studio, where output grew sensibly, pavilions started working with full capacity, and the operating personnel acquired some work to do; another thing is that this happened largely due to shooting Russian TV series. As a result of those changes movie-makers came up with an alternative to the stingy and slow state machinery. In 2005, three Ukrainian full-length films were being shown at the same time; the year after that their number increased to four and continued to grow, reaching ten in the 2007-08 season — a number that would have seemed fabulous in the early 2000s. Moreover, the post-revolutionary 2005 was marked by a real sensation for Ukrainian cinematography: the film Travellers by the young director Ihor Strembytsky won the Golden Palm in the short film competition of the Cannes Film Festival. Ihor turned the lack of good film in the Karpenko-Kary University into the quality of cutting, which made his debut poetic and energetic — things unattainable for his fellows. At the same time Ukraine became somewhat fashionable. Hollywood films featured Ukraine and Ukrainians with greater frequency, episodic Ukrainian characters started to appear, foreign film directors began to pay attention to our country as an advantageous location for shooting. Ukraine found its place in the works of such significant artists as Zhang Yimou (Hero), Ulrich Seidl (Import Export), Michael Glawogger (Workingman’s Death), Jean-Luc Godar (Film Socialism). Regrettably, the crisis of 2008-09 impeded the growth of the second half of the decade. Because of the 2008 recession most of the projects were frozen or canceled, production dropped to a dangerous minimum once more, lamentations about a national catastrophe returned. However, the situation did not backtrack all the way to the ruins of the 1990s. Certain distribution and production capacities already existed, and, most importantly, several outstanding film directors continued to work, braving the crisis. Their productions became noteworthy events, going beyond the country’s borders. So, in 2008, after a five-year break Roman Balaian shot the late-Brezhnev-era drama Birds of Paradise. The movie was produced both in Ukrainian and Russian. The main roles were played by Oksana Akinshina and Oleg Yankovsky. 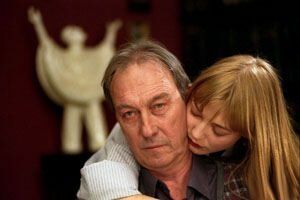 In spite of the apparent signs of director’s creative fatigue, the film was remembered by Yankovsky’s performance (that was one of his last roles) and won the Nika Prize in the category Best Film from the CIS and Baltic Countries. Certainly, “Muratova’s casus” is one of the most controversial questions in Ukrainian cinematography. Her previous reputation as a pro-Russian or Russian director is flawed. To begin with, she is a European, both in terms of birth and education: she received school education in pre-Communist Romania, her parents were born and bred Europeans, though with leftist inclinations. Language is the only thing that Muratova and Russia have in common. Even that is a kind of pidgin, i.e., the south-Ukrainian version of Russian. Muratova feels the music of those dialects and can work with them. Language should not impede the major issue in such a globalized business as movie-making — the author’s identity. Language has never been a burden for significant film directors: Luis Bunuel, Michelangelo Antonioni, Francois Truffaut, Wilhelm Wenders, Lars von Trier. They are all outstanding artists of their countries. In our circumstances, shooting films in Russian does not mean the directors are trying to assist foreign rule (propagandists and TV networks deal with this): first and foremost they realize themselves as artists working and creating in Ukraine, inspired by its realities, and working with Ukrainian actors. Muratova’s evolution as a movie-maker is a topic for a separate research. It is just worth mentioning that she began her career as a talented follower of the French new wave, a revolutionary direction for world cinema on the whole, and especially for Soviet and Russian cinematography. Her approach to editing, scriptwriting, and casting indicated that she was a talented follower of Godard and Truffaut, albeit in her own unique way, extremely remote from what was going on in Russia, where either blind copying of Hollywood productions or metaphysical Tarkovsky-style sluggishness prevailed. Moreover, I will dare assume that Muratova, in terms of her films’ content, is a Ukrainian director, because the baroque spirit that is crucial for Ukrainian modern culture can be found in all her works. The passions swirling in every movie she produces, the weird fey characters, complicated dramatical structure, attention to visual details, refined, fundamentally asymmetric composition of shots, suffering that goes together with comic intonations, and finally, the general atmosphere filled with dramatic elements have long ago been established as signs of her personal style. Moreover, the director’s latest work, A Melody for Street Organ is structured according to Ukrainian vertep (Nativity Play), hence is a seemingly neo-Baroque work. Thus, Muratova succeeds in showing the primary tragedy of Christian Christmas. And living Ukrainian language and songs are heard throughout the film. Without doubt, The Melody… has become the most Ukrainian movie made by Muratova, it was also secured by the competent producing work carried out by the Sota Cinema Group Company, which also cooperates with Balaian. The credits to Muratova’s latest films mention the only country of production, Ukraine, which has become a fact for our neighbors: Russian mass media always refer to Muratova as a Ukrainian director, and even the most persistent admirers of the “Russian world” beyond Russia do not call it into question. The Sota Cinema Group was also involved in another breakthrough made by our movie-makers: for the first time in Ukraine’s independence a Ukrainian film — funded jointly by Germany and the Netherlands — My Happiness by Serhii Loznytsia took part in the full-length competition of the Cannes Festival. It should be mentioned that the fact that we lack awards of such a level does not mean non-recognition. Simply being selected to the main competition of the Cannes Festival out of hundreds aspirants throughout the world is a prize in itself, just like being nominated for the Academy Awards is already an award in itself. Loznytsia, a successful documentary film director, residing in Germany at the moment, made an epic film, a parable about Russia’s primordial troubles, shooting it in Ukraine where he grew up, lived for 27 years, and started to develop as a movie-maker. It would be impossible to shoot this film in Russia not only because of the Russophobia noticed by the Russian intellectual community (apparently by mistake), but also because Loznytsia divulges his baroque nature in his live action film debut. The entire structure of the film, with repetitions and parallel motives, the hero covering the path of inhuman suffering in order to turn into a symbol, embodies the fate of this land. Another name that cannot be ignored is documentary film director Serhii Bukovsky. He acquired cult status in non-live-action cinema in the early 1990s. He shot two outstanding works in 2006 and 2008 dedicated to the greatest catastrophes in Ukraine’s modern history: Call Your Name (about Holocaust and Babyn Yar) and Living Ones (about the Holodomor). The works are so convincing artistically that their influence should exceed the limits of non-live-action cinema, and in a sense this is a turning point in our documentary cinematography. So, the main problem of present-day cinema is not financial (it can be overcome as we can see), but rather a generation gap. There is no worthy generation to replace Muratova, Balaian, and Bukovsky. Producers engage mature masters, including fo-reign ones, but this does not develop the Ukrainian school of movie-making. We have some young directors, but they lack ideas: despite delivering rebellious manifestos and declaring the emergence of new ways, they are unable to bring anything innovative to the screens. Ukraine is gradually riding out the crisis; there are independent production and distributing companies, there are enough good actors, cameramen and cutting experts, reasonable equipment has appeared, in a word, there is an infrastructure to realize ideas, but there are no ideas. Apart from the abovementioned exceptions, the Ukrainian cinema community remains passive, which is the major threat to our movie-making process. The coming 2010s are going to be rich in events: we will see attempts to establish a new authoritarian regime and society’s resistance, even a new revolution is possible. All of this is a real challenge that will need a response from the national cinematography. On the other hand, in neighboring Romania, with democracy but social and economic problems like our own, the young cinema is a global phenomenon: Romanian films are winning prizes at the Cannes Festival annually. It is hard to give prescriptions here. The role of the state, the amount of investments, and problems with corruption are all major issues. Unfortunately, the destiny of the important law on the support of domestic movie-making depends on the statesmen: it was approved by the Verkhovna Rada, but Azarov’s Cabinet is in no hurry to pass the necessary bylaws, thus blocking its implementation. This is no surprise, as reducing taxes and Azarov are incompatible. And every chance wasted by our bureaucrats will affect our future. Yet, I will repeat myself, the main thing is that really creative and energetic generation of movie-makers should appear. No one knows when this will happen. However, I strongly believe that we will see our new wave.